Modified to fit a 5-6 year old. No gull pattern down the sleeves. CO 60 sts. k2,p2 repeat to end. Continue this for 1.5”. round 1: knit to front lace panel slipping markers as you go. 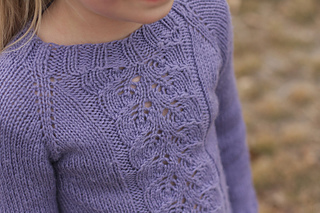 do the first row in the lace chart. round 2: k2, slip marker, m1L, k to next marker, m1R, slip marker, k2, slip marker, m1L, k to next marker, m1R, slip marker, k2, slip marker, m1L, k to next marker, m1R, slip marker, k2, slip marker, m1L, do the 2nd row of the lace chart, m1R. repeat rounds 1 and 2 following the lace chart as you go. Every time you are on an even number on the lace chart you will also be on an even numbered round. 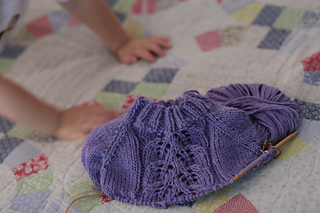 Knit (following lace chart) to 1” away from desired length. Switch to K2,P2 ribbing for 1” and then cast off. I managed to lose the rest of my notes on this :( but it was pretty simple. I think I pretty much stuck with the pattern but just with bigger needles. 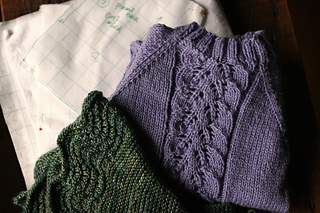 Next time I would change to smaller needles for the ribbing. I forgot to!